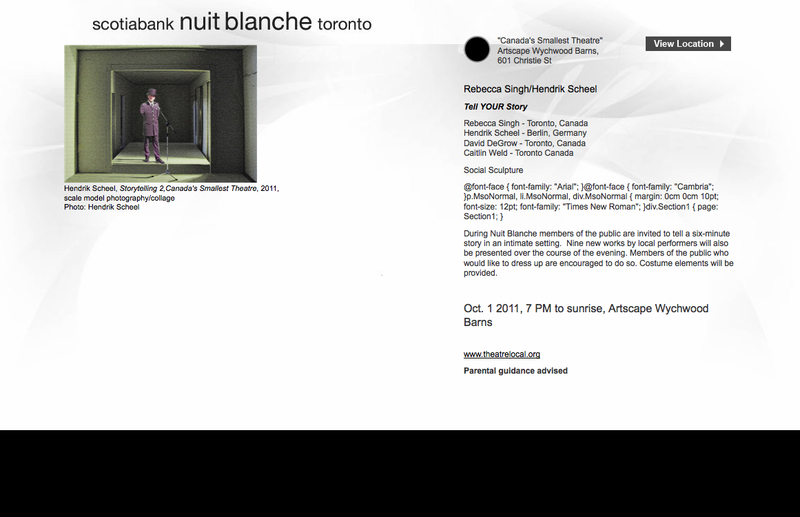 In her 5th year participating in Toronto’s Scotiabank Nuit Blanche (Open Field Study, SMASH! Droppin Stuff, Bouncing Brides), local artist and Wychwood Barns resident Rebecca Singh teams up with celebrated Berlin theatre designer Hendrik Scheel from Berlin on a project that has been over a year in the making. “Canada’s Smallest Theatre“ is a conceptual art work and installation that transforms an actor’s studio into a “12-seat pop-up theatre”, the setting for Tell YOUR Story. The Artscape Wychwood Barns are a refurbished street-car repair facility and the home of the Wychwood Artists’ Colony, and the old neighborhood of Marshall McLuhan who said “We shape our tools and they in turn shape us.”. This quote inspired the social sculpture; Tell YOUR Story, where, for one night only, at Scotiabank Nuit Blanche, the community gets to take the stage and star in the show. Rebecca has represented Canada as an artist abroad and works here as a freelancer and creating and developing new projects for major institutions such as the Luminato Festival. Hendrik works full time as a designer in the German theatre system and has received awards for his development of experiential educational projects dealing with difficult subject matters. He recently won a national prize for a project about the Berlin Wall: “AUF DER MAUER, AUF DER LAUER” Stories and art from children for children. During Scotiabank Nuit Blanche members of the public are invited to tell up to six-minute stories in an intimate theatre setting. Members of the public who would like to come dressed up are encouraged to do so and grace the stage of “Canada’s Smallest Theatre”. Some costume elements and guidance to get started will be provided, but the courage to perform is up to you! Tell Your Story is a social sculpture open to all and shaped by its participants, everyone is heartily invited to come and be a part of the art! The Indigenous Youth Leadership Team will present “Skywoman”, an indigenous myth from the rich tapestry of our oral history. Cathy Gordon and Jonathan Heppner create work that breaks the fourth wall and challenges convention. Neema Bickersteth whose training and background is as a singer comes to us from the world of contemporary opera and will present her first devised work, a physical and personal statement about self-expression through song. Rutz a visual artist working in Toronto since the 70’s and new to the theatre form will take the stage to present her story, a life explored through a graphic novel narrative. Litmus Theatre brings a fresh and highly inventive spin on classical theatre that packs a punch in tight spaces. Members of the public will be able to present a short story all night long but to help keep things going we have pre-booked some people to kick things off every hour. The following is a little bit of information on them and of course please do come and be surprised by who and what you will find onstage on the night! 7:00pm The Indigenous Youth Leadership Team will present a shadow puppetry rendition of the story Skywoman. Skywoman is a Haudenosaunee creation story that reveals all the mysteries of how the earth began on Turtle Island, better known as North America. 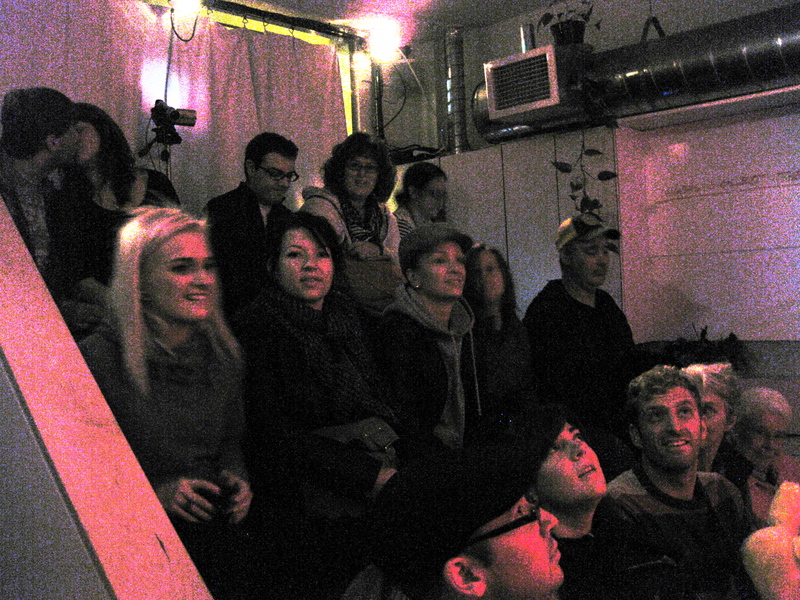 8:00pm Performance artist Cathy Gordon (www.cathygordon.com/) performs an improvisational piece. 9:00pm Opera singer Neema Bickersteth sings Rachmaninoff a capella while dancing. 10:00pm Storyteller Gail Nyoka tells the story of her first meeting with her father. 11:00pm Litmus Theatre shares a snippet of their story- an eerie yet magical re-imagining of the Macbeth story. 12:00am Rebecca Singh and Hendrik Scheel tell the story of how they met and Canada’s Smallest Theatre came to be. 3:00am LIVE From Nuit Blanche in Paris! Coleen MacPherson and Nina Gilmour tell THEIR story live via satellite! During Nuit Blanche members of the public tell a six-minute stories after being invited into an intimate setting. Members of the public who would like to dress up are encouraged to do so. Costume elements will be provided.